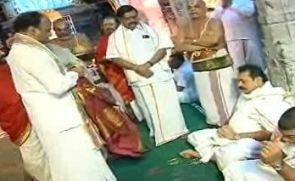 Sri Lanka President Mahinda Rajapaksa on Wednesday offered worship at the famous hill shrine of Lord Venkateswara in the wee hours near Tirupati. Rajapaksa was in the temple for about an hour, participating in the ‘Suprabhatam’ stanza recitation ritual conducted by a group of priests inside the ancient temple, temple sources said. Police had made tight security arrangements for the visit. A day after filing his nomination papers seeking third term for the presidential elections in Sri Lanka next month, Rajapaksa arrived on Tuesday evening to offer worship to Lord Venkateswara. Before leaving the temple, priests blessed him while the shrine’s management presented him with a sacred silk cloth, ‘prasadam’ and holy water. Andhra Pradesh Police on Tuesday took into preventive custody as many as 130 persons from Tamil Nadu who tried to hold protests against Rajapaksa’s visit to the temple town. Major political parties in Tamil Nadu, including the Dravida Munnetra Kazagham, National Democratic Alliance ally Paattali Makkal Katchi and Marumalarchi Dravida Munnetra Kazhagam, which walked out of the alliance recently, have been critical of the Lankan government on the Tamils issue besides the fishermen problem. MDMK chief Vaiko had quit the combine on Monday alleging that Narendra Modi government at the Centre has been acting against the interest of Tamils and condemned Rajapaksa’s visit. Meanwhile, a section of Tamil journalists alleged that they were assaulted by police while covering a protest by MDMK members trying to wave black flags at Rajapaksa here. Some equipment including cameras was damaged in the melee, they said. MDMK chief Vaiko said his party workers staged a black flag protest against Rajapaksa at Tirumala. Meanwhile, about 40 people, including half a dozen media persons hailing from Chennai, along with a local cable media person, were forced into a bus by police at Tirumala, a few minutes before the departure of Rajapaksa from the temple. The incident occurred when a group of people waiting on a sidewalk abruptly tried to venture onto the road near Lepakshi Circle, a kilometre from the temple, to protest the visit of Rajapaksa to the hill shrine despite security arrangement, police said. Some journalists alleged they were lathicharged and police forcibly bundled them in a bus along with the protesters. They were dropped at a place near the Gogarbham dam, four kilometre from the temple in the wee hours. Police said they are believed to have left for their destinations. Nexus 6: Bigger, better and beautiful, but costly!